From the December 2015 Issue Every once in awhile, an animated film can inspire people and be just as intelligent as any live-action film. Through its strong themes and meaningful message, The Last Unicorn is certainly one of these films. The Last Unicorn is an animated film directed by Arthur Rankin Jr. and Jules Bass. Its screenplay is written by Peter S. Beagle, the writer of the original novel, on which the film was based. 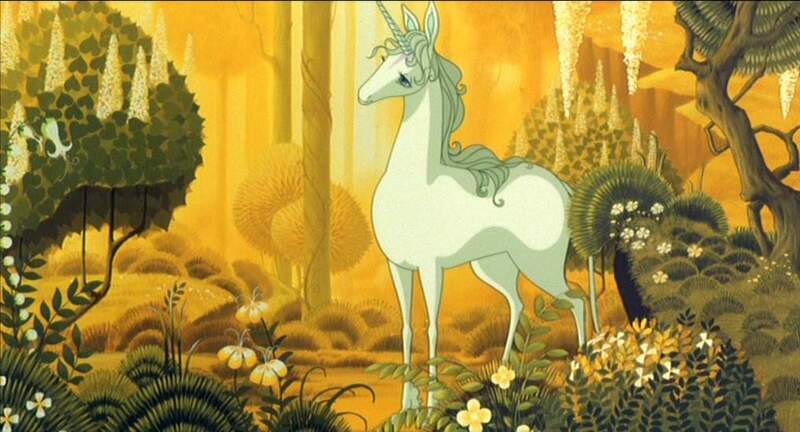 It tells the story of the titular “last unicorn” (also known as Lady Amalthea), who wants to find other unicorns. Those she seeks were driven away by the Red Bull, at the command of King Haggard. On her adventure, she meets many interesting creatures and characters. The audience is also shown how the world in which the story takes place no longer believes in magic and fantasy. The Last Unicorn is worthy of analysis because of how every aspect of the film contributes to the themes of maturity and innocence. Its story, characters, art design and music are impressive for a children’s movie. All of these elements help make The Last Unicorn a memorable and meaningful experience. One of the film’s notable aspects is how it subverts the tropes of fantasy stories. In this particular tale, mythical creatures are often shown to be nothing but illusions. This is showcased by the witch, Mommy Fortuna, who captures real animals and uses magic to make them appear to be fantastical creatures (such as when she makes a snake look like a dragon). It is stated that she is able to do so because humans will believe whatever is most convenient to them. Magic is also shown to be unexceptional when compared to the magic portrayed in older fantasy stories. This is applicable to the character, Schmendrick, a wizard that the unicorn meets early in the film, who uses magic, but usually with disastrous results. In one case, Schmendrick accidentally turns the unicorn into a woman. This is to show how the magic in this world is not without limitations and doesn’t always work the way one wants it to, unlike other fairy tales where magic is able to do anything. Another way the film subverts fairy tale tropes is through King Haggard. Haggard is different from most fairy tale villains because instead of wanting power and wealth, he’s only looking for happiness and feels that he needs to keep anything around him that will give him that feeling. As a result, he kidnaps all of the unicorns in order to view them for his enjoyment whenever he wants. Also unusual is the fact that Haggard only has four people in his court and is very lonely, unlike the typical king, who has many people serving them. Additionally, Prince Lir (Haggard’s son) believes that by playing the role of a hero, he can gain the affections of Lady Amalthea. He slays monsters and tries to write poems to impress her, but fails to gain her affections. This is in direct opposition to old fairy tales, in which heroes would attempt to attract women through similar means and typically succeed in doing so. The Last Unicorn also deals with how people lose their innocence and belief in fantasy as they mature. Many characters in the film view unicorns as nothing more than white horses. A character that epitomizes this idea of nonbelief is Molly Grue, who is the wife of a bandit named Captain Cully. She laments how she has never seen a unicorn before and feels that she has grown old without experiencing the fantasy stories that she was told as a child. Alternatively, Molly’s husband doesn’t believe in any of these stories. When he hears someone mention Robin Hood, for instance, he gets upset and states that Robin Hood is a myth and that he and his bandits are better than this fictional character. Just before she meets the Unicorn, Molly gives up on the fairy tales she was told as a child. Later on, the Unicorn undergoes a similar development when she is transformed into a woman (a metaphor for maturing). As the Unicorn spends more time in the human body, she becomes unable to see other unicorns and begins to learn about love and regret—two qualities that unicorns aren’t able to experience. This is analogous to how other characters could no longer see unicorns because they had grown old and stopped believing. The Unicorn also subverts expectations like the human characters. Despite the fact that she is portrayed as kind and innocent, the Unicorn maintains a low opinion of people and believes that being human is the worst fate that could possibly befall her, due to them being both mortal and susceptible to feelings of regret. Her position evolves throughout the movie, as she comes to accept humanity and no longer thinks little of mortality and regretful feelings. Another important aspect of The Last Unicorn is the music. Composed by Jimmy Webb and performed by the 70’s soft rock band, America, with the London Philharmonic Orchestra, the soundtrack helps give the film a gloomy feel and has multiple tracks that elevate the drama during scenes in which there is conflict. “Red Bull Attacks” is a track that increases tension, making the Red Bull appear more intimidating in the process. Performed by America, the lyrics of the film’s main theme perfectly describe the main character as a beautiful creature that inspires hope in the people around her, even when they no longer have much to believe in. Music is also an important aspect of the film’s plot, as songs manage to express certain developments of character. This is true with “Now That I’m a Woman,” which illustrates how the Unicorn feels when she becomes human and how she learns to accept it over time. The song, “That’s All I’ve Got to Say,” informs the audience of the relationship between Amalthea and Prince Lir, without them being on screen together too often prior to that scene. The art direction of the film adds to the wondrous nature of the fairy tale-like setting. Locations in the story include the serene forest and a massive castle. The art consists of painted backgrounds that constantly utilize the color blue, which gives the film a somber and dream-like tone. The art is also employed to show dramatic, thematically-relevant changes in weather, such as when the Unicorn leaves a home set in eternal spring and enters a harsher world where she experiences winter.The background art is good at adapting to different locales. This is exemplified when the characters enter King Haggard’s kingdom. With grey and other dull colors being added to the film’s color palette, the kingdom feels emptier and more barren in contrast to previous locations in the film. The characters also have memorable designs, with the Unicorn being particularly striking, sporting wide blue eyes a long mane and a white hide (symbolizing purity). This gives her an appearance that is both innocent and majestic. A few of the performances are also quite impactful. Playing King Haggard, Christopher Lee manages to balance the character’s intimidating qualities with his strong sense of melancholy. As the Unicorn, Mia Farrow captures the character’s unsullied heart and mature mind. Finally, Tammy Grimes sells the sadness and shrewdness of Molly Grue. The Last Unicorn is an amazing film that both confronts the tropes of fairy tales and crafts a wonderful and sophisticated story of its own in a way that elevates it above a lot of other animated children’s films. In addition to being complex and endearing, the characters each represent the subversion of different fairy tale tropes. At the same time, the plot devices effectively tie together the film’s various themes and the art and music contribute to the film’s aesthetic emulation of classic fairy tales. When the story ends with the unicorns being freed and King Haggard defeated, it also has Amalthea giving up her newfound humanity and love for Prince Lir to revert back to a unicorn. 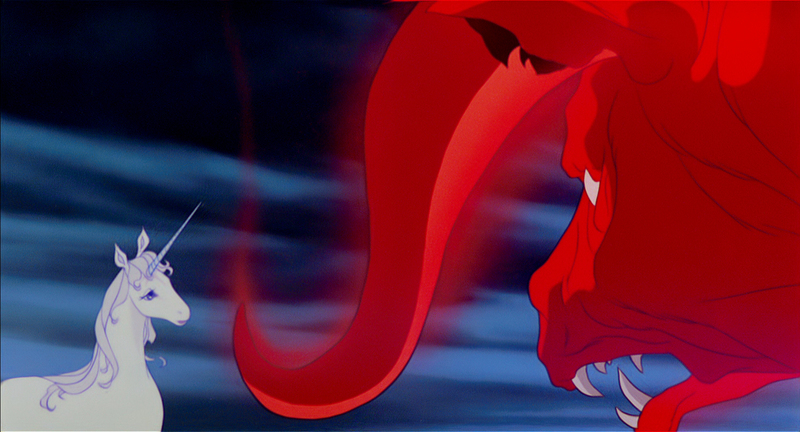 Unlike other children’s movies, The Last Unicorn shows how not everything can have a happy ending. It’s an important message that should resonate with many younger audience members due to its refusal to pander and acknowledgment of their ability to understand real-world concepts. Tags: December 2015, Kayla Hurowitz. Bookmark the permalink.